Evernote – Synchronisation On The Cloud & Why You Should Use It? We recently got a chance to lay our hands on to Evernote - which is supposed to be a web-based multi synchronization tool. At first we thought it must be just another tool that lets you syncronise all your computer work. But when we were into our 3rd day of using it on laptops and mobile, we were very impressed. Here is a detailed review about what all we liked about Evernote and a few words on how it's developers could make it even better. First, for the ones who want to get a brief overview about Evernote, here it goes. Evernote is a web based tool that lets you easily capture information on your laptops, mobiles and any other internet device. Evernote can be used to take quick notes, create to-do lists, clip entire Web pages, manage passwords, and record audio. The good part is everything added to Evernote is automatically synchronized across so whenever you open it from another device, you still get to access all that you saved from another device. Evernote is available as a download-able application for almost all desktop and mobile platforms. Here are the download links for popular versions of Evernote: Mac OS X, Windows, iPhone / iPod Touch, iPad, Android, BlackBerry, Palm Pre / Palm Pixi & Windows Mobile. One downside here is the unavailability of an Evernote application for the Linux platform. 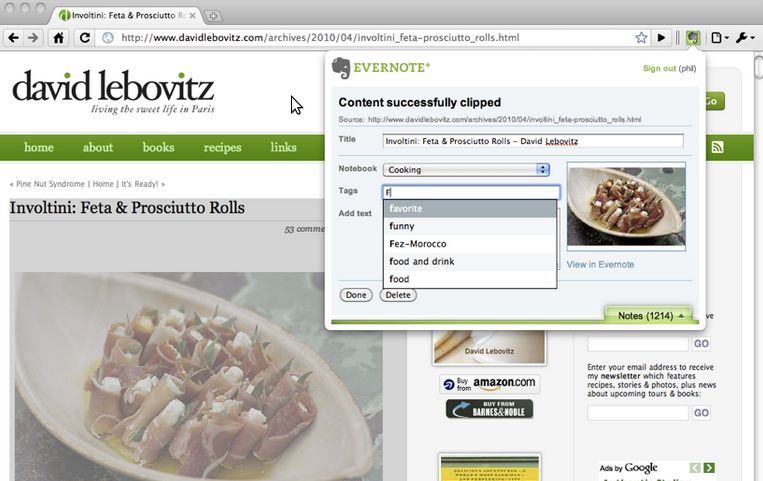 So Linux users can use Evernote via the Web Clipper. However there is a 3rd-party application for Evernote on Linux, called Nevernote which the linux users can look at. Getting used to use Evernote might be a bit tedious job but believe me it won't take you more than a day before you get used to using it with almost anything that you do on the web. I tried Evernote on my Laptop, my Android phone and also the Web Clipper. In this article I will talk mostly about the web-based clipper which was available as a Chrome Browser extension. Once, the Evernote Chrome extension is installed, all you need to do in order to note something, or store an important webpage is just hit the Clip To Evernote button on your Chrome browser. While using Evernote from browser, you can access all your clips and notes using the web based portal which is again as easy to use as the desktop application. The interface of both desktop apps and the web control panel is so smooth and perfect that it never makes you feel that you are just using some web based service. Here is a screenshot of the Evernote web control panel. Evernote lets you clip items to it and send other info directly via e-mail. All you need to do is send your to-be-clipped items to an unique e-mail address which will be generated by Evernote, only for you. The interface provides you with ample instructions to get familiar with the major functionalities. For all the webpages that you clip on Evernote, you get to see a screen capture that lets you easily identify your clips easily. Moving Ahead: Scope for Improvement? We are afraid that we do not have much to talk against this wonderful tool. It does what is meant to do, perfectly. However there are somethings which we feel Evernote should have in it's future versions. Social Media is something which we did not find integrated into it. At time you tend to browse all your old clips and you suddenly stumble one pretty useful information which you think your friends should know. This is where a "post to Facebook " may help. However, there is a twitter-Evernote integration that lets you send public Twitter messages, and private Direct Messages, right into your Evernote account which can be searched later. This way you can also create a backup for your tweets. Another thing which we would like to see is an increase in the available storage space which is just 1GB now for premium accounts. May be an integration with Dropbox or box.net could help in here. Evernote is free for use and you can experience all it's goodness without paying any money. However there some good things on Evernote, which you need to pay if you want to use them. And as they say "Good things come with a price tag", it holds true for Evernote too! Do try this awesome tool - Evernote and let us know in the comments section if it was useful for you.